Honmaru Goten (本丸御殿), meaning "the palace in the inner-most circle of defense", is the only surviving building of the former Kawagoe Castle. It used to serve as the lord's residence and offices. Kawagoe Castle was originally built in 1457. 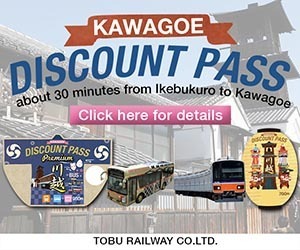 When Tokugawa Ieyasu took over its rule, he installed an important loyal subject as its lord, due to Kawagoe's importance as a trade city and a strategic point of defense north of the capital. Throughout the Edo Period, 21 lords, all closely allied with the Tokugawa Shogunate, resided at Kawagoe Castle. Today's structure was added to the castle in 1848, shortly before the end of the feudal age. Recently renovated and reopened to the public in 2011, it has spacious tatami rooms, a garden, and pictures of cultural heritage which are put on display. Visitors are also able to sit with three models of a feudal lord and his vassals, and imagine what it must have been like to hold a discussion in that room. Honmaru Goten is a ten minute walk from the Warehouse District or Kitain Temple. The Kawagoe City Museum is located just across the street.